On an entirely normal, beautiful fall day, a small town is suddenly and inexplicably sealed off from the rest of the world by an invisible force field. No one can fathom what the barrier is, where it came from, and when or if it will go away. 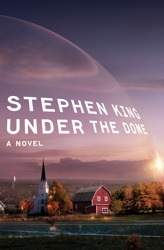 Now a few intrepid citizens will face down a ruthless politician dead set on seizing the reins of power under the dome. But their main adversary is the dome itself. Because time isn't just running short. It's running out.